What do you think? 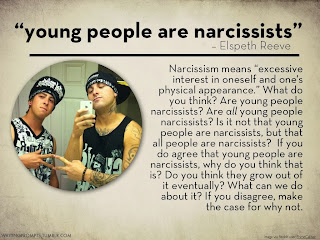 Are Young people narcissists? Are all young people narcissists? Is it not that young people are narcissists but that all people are narcissists? 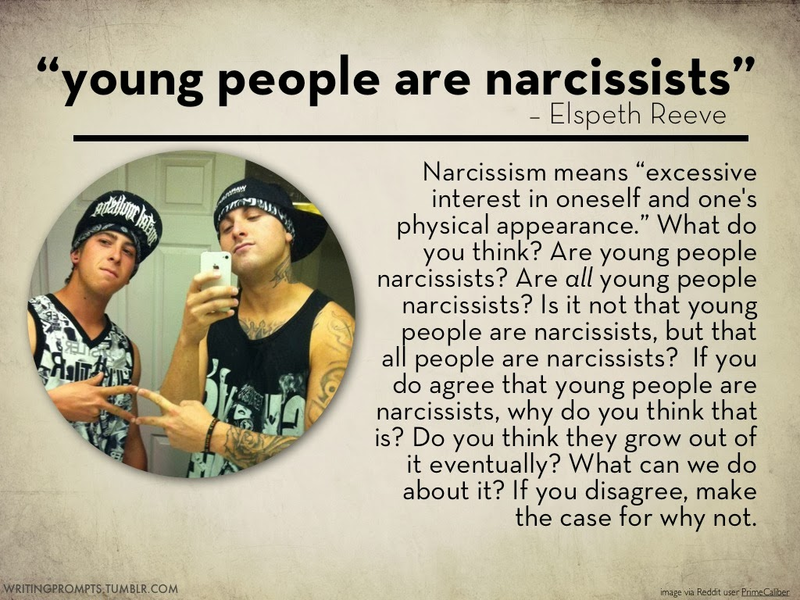 if you agree that young people are narcissists why do you think that is ? Do you think that they will grow out of it eventually? What can we do about it? I think that some young people and even adults are narcissists because most young people follow each other and also take selfies so they can fit in. Also when people take a picture of themselves and get compliments and likes it boosts their self confidence but mostly too much to the point where it becomes excessive. I don't think that all young people are narcissists because some don't care and don't even care about fitting in or are already happy enough with themselves. I think it's mostly young people that are narcissists because adults don't have enough time and usually don't even know how to work instagram, twitter or the internet in general. I agree that young people are narcissists and I think that is because the media puts us down with all the pictures of models that are photo shopped. I think that young people will grow out of it eventually because they will have a lot more responsibilities soon so they will have no time to take " selfies". I don't think we can do anything about it.